I found out about this timely Thanksgiving challenge over at my friend Storyteller’s Sacred Ruminations blog. 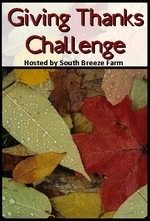 She introduced her readers to Leah of South Breeze Farm, who is hosting the second annual Giving Thanks Challenge. If I had signed up at the beginning of the month, I would have listed daily something for which I am thankful. Well, I do love calling to mind the many blessings for which I want to remember to be thankful, so I’ll start now. My November 13th post was a list of 13 Things For Which I Am Thankful. Even when we are ill (which some of us in our family are today) we have a clean, warm home in which to rest, nourishing food and soothing hot drinks to move us on the road to recovery. Our discussions in Bible study before church. They are lively, helpful and edifying. Today it wasn’t raining. I AM thankful for the rain, too, but blue skies are a cheering sight. Gasoline prices are going down! Our children love to learn, and are doing well in school. Soccer season and football season are over, so the children don’t have to practice and compete in the chill and rain. I must say again, I am SO THANKFUL for the faithful preaching of God’s Word. I’m thankful for true friendship. Our pets are a blessing, too, in the affection and entertainment that they afford. I am thankful TO the Lord, Maker of heaven and earth, and Redeemer of His people, for Who He is, and for all these other blessings that I listed! Now it’s time for a quick walk before returning to church this evening, so Adieu!